Hard work and first-class teamwork between the gear factory Hänel and Hainbuch have paid off. The new mandrel Mando G211 for gear manufacturers, suitable for gear hobbing, gear cutting and gear grinding, is now available as a standard mandrel from stock and can be used optimally on gear cutting machines. Not only for Hainbuch was this project a success, but also for Hänel. This enabled optimization of manufacturing processes, reduced set-up time and improved gear quality. Because the mandrel guarantees stable clamping and dampens vibrations. Hänel initially received two prototypes of the Mando G211 mandrel in sizes zero and two. 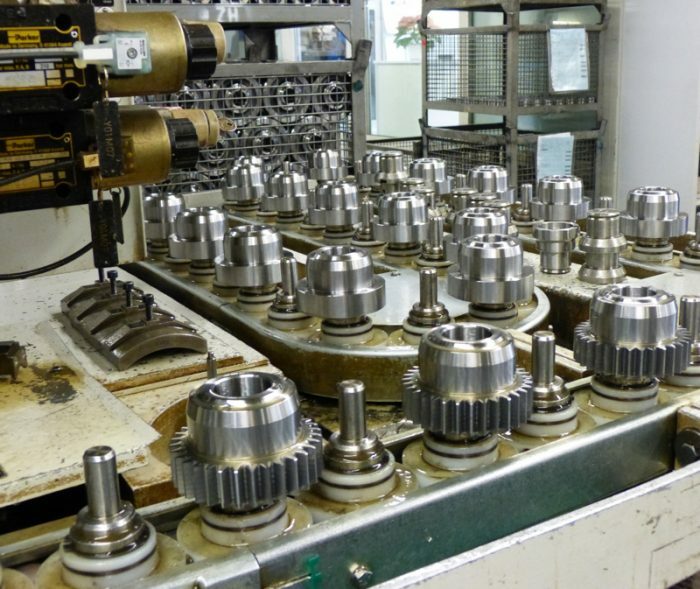 The mandrels were tested on the Richardon R 400 manual loading machine and on the Gleason-Pfauter GP 200 hobbing machine with automatic loading to see if they would be compatible and work properly. Renner has to admit: “For our employees, this new clamping system was very strange. For 20 years, they worked with a clamping system from the machine manufacturer without radial clamping, which worked fine so far. For the first attempts, we had to make some adjustments to the machine. In addition, we did not reach our zero line on the Gleasen-Pfauter machine because the mandrel was too tall. As a result, adjustments to the machine and loading system were required. It also turned out that the mandrel had to be technically slightly optimized. What followed were a few conversations and phone calls with Thomas Steiger, Product Manager and Hannes Ludwig, the responsible Designer, both at Hainbuch. We have diligently tested and passed on all the information needed to further optimize the mandrel.” All design changes were implemented by Hainbuch. Subsequently, the revised second prototypes were made available. After a lengthy field trial and a few minor adjustments to the machine, the stiff and slender mandrel could, thanks to the use of Hänel, go into series production and be produced for stock. At Hänel the batch sizes are between 30 and 1,000 pieces. Customers are buying their gears because of the precision. As a rule, these are hardened and ground gears in a very high quality. For this reason, the most important requirement for Renner was to save a single manufacturing step on this new mandrel, namely the rework. “With the current clamping system, we did not manage to achieve a good concentricity. The workpiece was pressed axially downwards. Now it is clamped with the mandrel from the inside, radially outwards. Thus, we have a higher stability within the clamping. This eliminates the reworking of certain components. For some of our orders, the old clamping system was good, because the concentricity was not so important. But basically, I must say, the better the concentricity, the easier it works later. With a normal hardened gear, the bore still needs to be reworked, but all the workpieces that are fully geared can now be reduced to one operation”, says Renner. For more information, please visit http://www.hainbuch.com.